Human evolution has been explored, questioned and personified in a variety of ways depending on the intricate evidence presented at the time being. And I’m no ancestry alien to prove any theories on human evolution right or wrong. 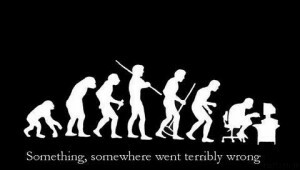 However, as a friend to the human race which has evolved over a thousand years, I think something went very wrong. Once the man who was dependent on a spear is now dependent on a computer. Well I shouldn’t be complaining or anything, probably because I’m that ‘man’. Well, one of many. If you just had a feeling of guilt or a guilty giggle, then count yourself in too. I was merely 10 years old when I first encountered the ever evolving world wide web. However, unlike the human evolution, the web evolution didn’t take over a thousand years to become what it is now. Don’t you ever wonder, how this thing called internet started? how people went from writing on cave walls to facebook walls, farming on paddy fields to farmville, discovering new lands by sailing the seven seas to Google Earth, deciphering hieroglyphics to winking on emoticons, communicating through morse code to skype or even sending telegrams to instant messaging. Well that’s technology for you folks. Just like the human race, wouldn’t it be fascinating to track the evolution of a website?. 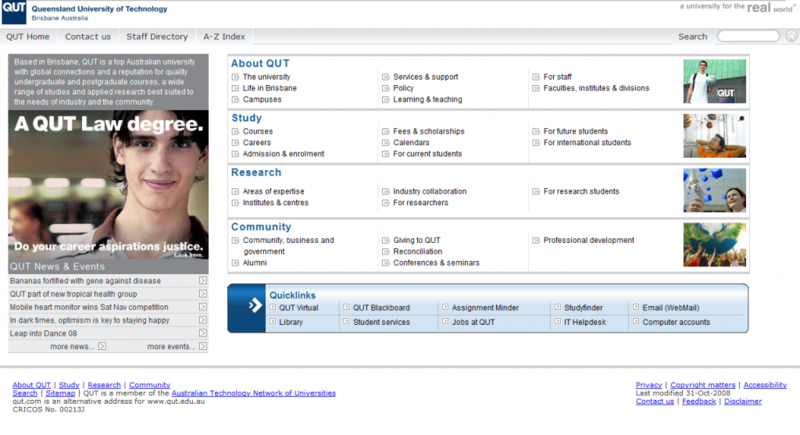 Let’s put our beloved QUT website to test and see how it has transformed dramatically over the past decade and some. 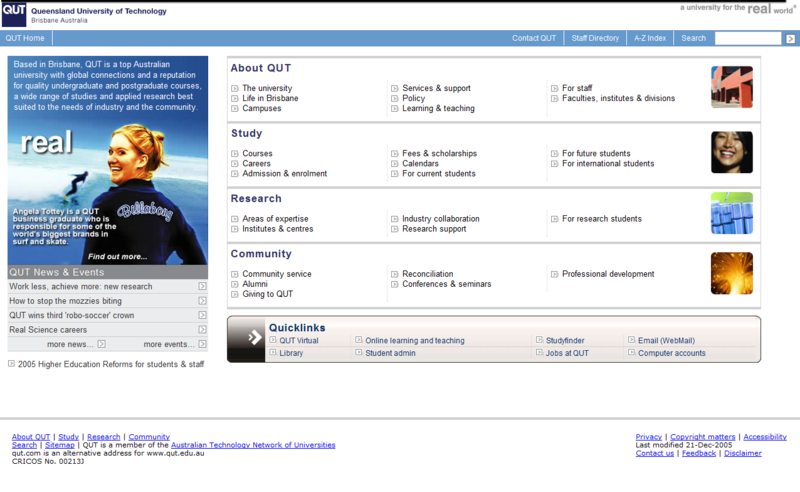 You’ll see the screen shots of the QUT website from 1997 to the brand new launch site in 2011. And ladies and gentlemen, I would like to present to you – The Way Back Machine. No, I didn’t come up with that name, it is an actual website that records the history of websites. A Digital Time Capsule, per se. And as they say, out with the old in with the new. It’s always good to see an aesthetically pleasing website that is keeping up with the new web technologies as well. As with any new change, people will be sure to take time to adapt to it. 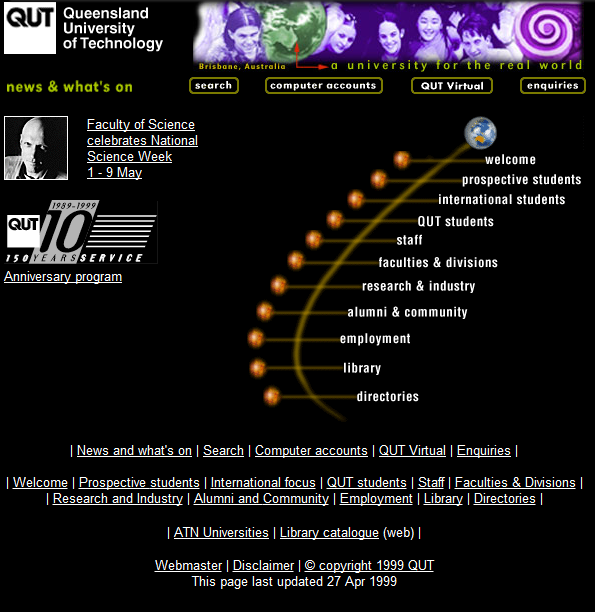 But till then, do you have any favorite designs from the QUT web site evolution so far? Great Blog! The new website looks great, but the search function needs a lot of refining, sometimes going on google and typing ‘QUT (whatever you want to search for)’ is the best way to go. I agreee. The search function of the previous website was far more effective than the new one. May be that could be one of the things they could improve for users to have a better experience. i rly like the new one…hah.. 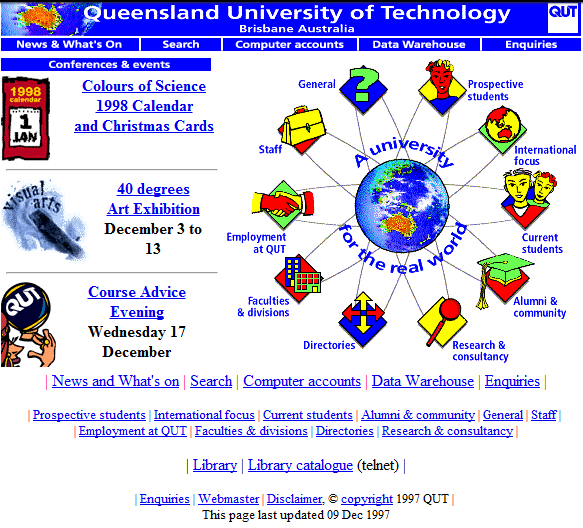 I like 1999 website. It’s good thing you had it all recorded? But I guess, regardless whatever designs it has, functionality is the same. The cultural and the university context is what matters. From an aesthetic point of view the 1999 design wins hands down for me. However as we know with websites, it’s ease of useability is what counts, not what it looks like. And the stat’s support this, they indicate that white wording on a black background is not a good choice. Comparatively, 2011 design best suits the usability factor of websites, minus lacking of an effective search function. Although, i see your point in the 1999 design. It is quite eye-catching infront of the other designs with the white background.